TOTO’s UltraMax II toilet is one high performing unit, both in terms of style and functionality. The traditional silhouette has a contemporary twist that will meld easily with most bathroom decors, and it’s ADA compliant, making it an accessible choice for users of all abilities. The UltraMax II’s bowl is coated with TOTO’s extra smooth CeFiONtect glaze that works in tandem with the powerful Tornado Flush system to sweep away waste and residue before it can cling to the sides of the toilet. 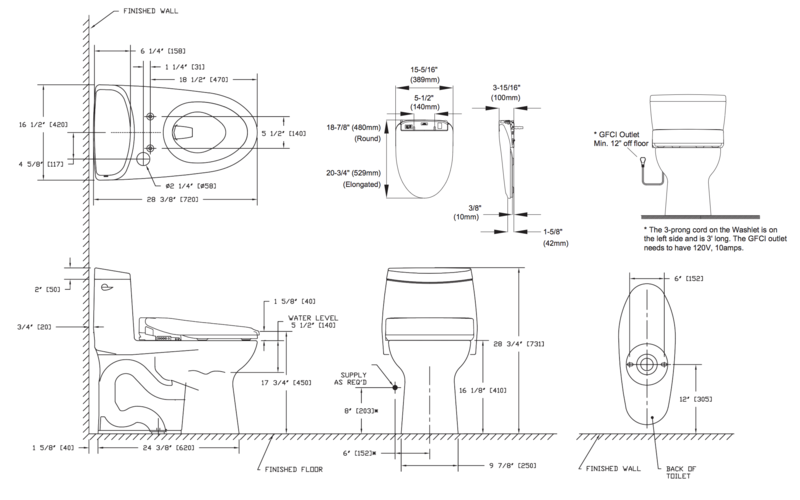 In addition, this toilet and bidet system is a bit different from your average toilet and bidet in that they’ve been specially designed to fit together so that the bidet seat’s cords and hoses are concealed from view for an aesthetically pleasing look. Do keep in mind that the UltraMax II is only able to hide the water and electrical hookups of TOTO Washlet+ bidet seats, and similarly, the S300e Washlet+ that comes in this system is only compatible with TOTO Washlet+ toilets. The S300e Washlet+ is packed with top of the line features that provide a truly luxurious toileting experience. Four wash modes—front, wide front, rear and soft rear—provide superior cleansing no matter the situation, and the oscillating and pulsating spray options soothe and relax tender areas while encouraging the bowels. The instant water tank provides unlimited warm water for washing, and the water temperature, water pressure, seat temperature and wand position can all be adjusted to fit your personal preferences. For extra peace of mind, the S300e uses sterile, electrolyzed water (eWater+) to premist the bowl before use, thereby discouraging residue from sticking, and to sanitize the bidet’s nozzles after each use. The warm-air dryer allows you to get dry without relying on abrasive, expensive toilet paper, and the automatic deodorizer chases away odors for embarrassment-free restroom trips. For added convenience, the remote control comes with two user presets that allow you to pre-program your favorite wash and dry settings so that you don’t have to manually select them each time you use the unit. The seat’s energy saving mode cuts back on the electricity it uses when not in use for optimum efficiency, and the lid closes softly to avoid annoying slamming. From start to finish, the TOTO UltraMax II Washlet+ S300e One-Piece Toilet and Bidet System provides a top-notch bidet experience that will leave you feeling clean and refreshed.